One of the six turbines of the Lower Monumental Dam has been lifted out of its pit to allow repairs. 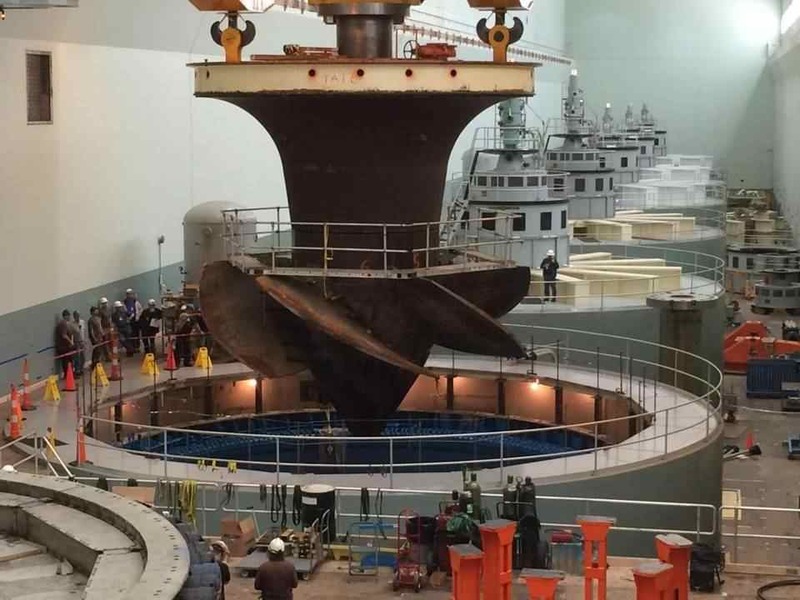 "It has been more than 20 years since Lower Monumental has had a turbine removed so it was a major event for us," said Bryce Thompson, chief of tech at the dam, in a statement. "The turbine removal was necessary in order to replace some broken hub linkage pins inside of the turbine that allow the blades to rotate." The Army Corps awarded a $12.9 million contract to Andritz Hydro, an international company, last year for the repairs and for generator winding replacement. The work is planned to modernize the hydroelectric facilities at the dam on the Snake River. Three of the generator units at the dam went online in May 1969, including the one with the turbine removed. No significant investments made to improve the reliability or increase the capability of the generating units since the three units were installed. The work being done includes completely disassembling the turbine runner, which is the critical component in the power train and also plays a role in fish passage past the dam. Internal hub components will be installed and the runner reassembled. As components of aging power-generation infrastructure are replaced, the Corps is replacing them with an eye on sustainability and better generation efficiencies, said Jason Williams, project manager for the work. The entire project is expected to be complete by May 2017.